How does failure affect you? Every new venture has the potential to succeed or fail. ..BUT only if you actually take a risk. This is very true for churches when they launch their first multisite campus as well. Nine months since our launch and the lessons continue to flood in weekly. Recently, our streaming video teaching failed in a BIG way! So I thought I’d write about it (insert smirk). What exactly happened and why is less important than actually taking steps to ensure that this virtually does’t happen again. Our team got together during the week, collaborated, and agreed on a process. All I can say is that the next campus our church launches should be much better off as a result of the lessons we’ve learned. So, what are we to do when things go wrong…whether we caused it or not? The choice is up to you and I. Here are 4 ways to EMBRACE failure. 1) Expect it | What we can see coming (to a degree) prepares us to better deal with it mentally when it hits. It’s like a warning. And I’m not talking about pessimism either. Reality and experience teach us that failures are a part of life. 2) Don’t fear it | Fear can keep us from taking future risks. Fear screams, “Don’t even try that!” Here’s the thing, fear of failure crowns complacency as King. We don’t want that. 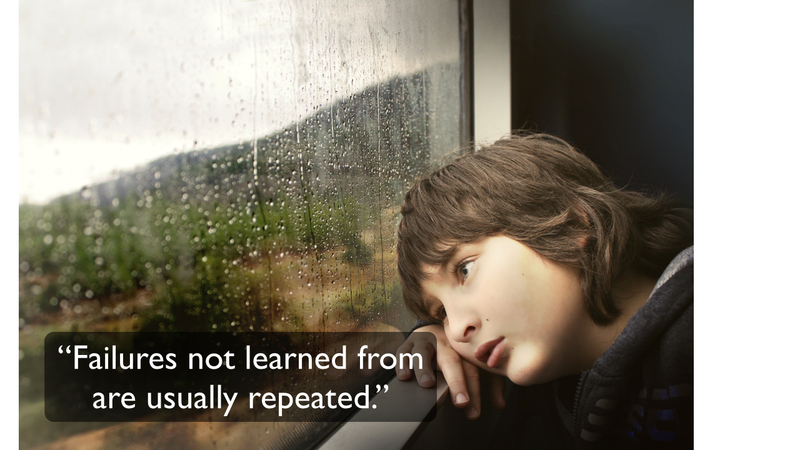 3) Learn from it | Failures not learned from are usually repeated. If you continue to stub your toe on the same item when you get up in the middle of the night to use the restroom, don’t you eventually move that item? Learning usually requires some level of adjustment. Leaders who don’t learn from their failures fail to grow. 4) Share it | Grab a huge piece of humble pie, own your “Well that didn’t go as I had hoped” moment, and help others to grow their leadership from your experience. Most of the incredibly helpful leaders I have learned from in the past 20 years of ministry realized that sharing their personal mishaps actually helps further Kingdom work. It offers hindsight to younger, less experienced leaders. I think that can apply to leaders too. Think about it. Ten years from now don’t you hope to be a stronger leader than you are today? Leave a comment below. I would love to hear from you. To think…….one step closer to success. No wonder a failure is meant to be embraced. I am thankful for my failures as each is one more out of my way.